Read texts in a reflective manner in order to understand power, inequality, and injustice in human relationships. Reflect on the role their own perspectives, values, and beliefs play in understanding a text. Analyze a text from multiple perspectives, including perspectives excluded from the text. Consider the social implications of a text and identify personal actions that can be taken towards a just society. Our prior knowledge, values, and beliefs can influence how we understand a text. All texts communicate values, beliefs, and perspectives. 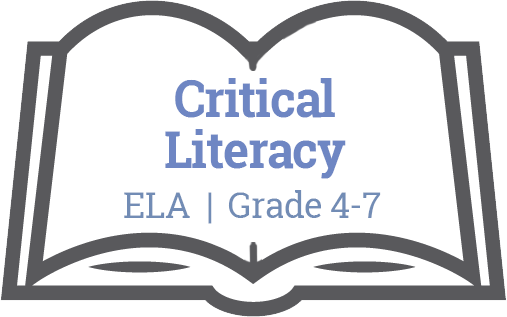 Good readers use strategies ask questions to deeply understand a text in a critical manner. Considering different purposes, audience, and perspectives in exploring texts. Identifying how differences in context, perspectives, and voice influence meaning in texts. Recognizing the role of language in personal, social, and cultural identity. Applying a variety of age-appropriate thinking skills and critical literacy strategies to gain meaning from texts. Talking and thinking about learning (e.g., through reflecting, questioning, goal-setting, self-evaluating) to develop one’s awareness of self as a read and as a writer. Communication: I recognize that there are different points-of-view and I can disagree respectfully. Critical and Creative Thinking: I can analyze evidence from different perspectives; I can analyze my own assumptions and beliefs and consider views that do not fit with them; I can ask open-ended questions and gather information. Personal and Social: I understand how my values shape my choices; I can analyze complex social and environmental issues from multiple perspectives; I can take thoughtful actions to influence positive, sustainable change; I can explain why something is unfair; I can advocate for others; I take action to support diversity and defend human rights, and can identify how diversity is beneficial for my community, including online. Learning ultimately supports the well being of the self, the family, the community, the land, the spirits, and the ancestors.